This is a guest post from one of our readers. If you ever have something you’d like to share or an idea you need help developing, please email us baseballprospectustoronto@gmail.com and we’ll happily take a look. xwOBA, or expected wOBA, is a statcast proxy for contact quality, based on launch speed and angle. This number is an expected rate of wOBA based on the average result at that launch angle/speed. 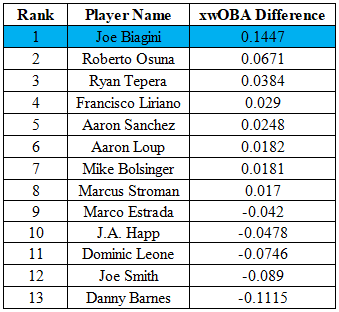 Last year, the average xwOBA for Blue Jays pitchers included in this analysis was 0.344. This is where I find things become interesting. 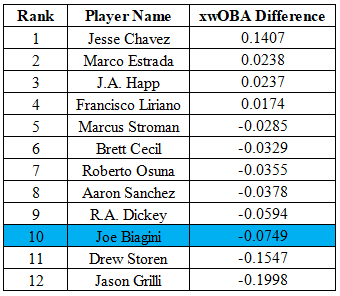 Despite this success in limiting hard contact on the whole, Stroman outperformed Biagini in a number of other important metrics, including DRA. 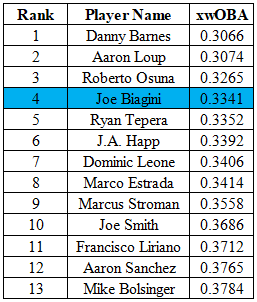 In fact, while Biagini’s contact quality was fourth best on the team by this metric, his ERA was third highest among the group. 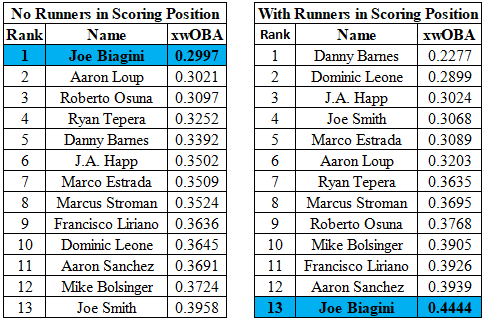 The only two pitchers whose ERAs were higher were Francisco Liarino and Mike Bolsinger, who came in at 11th and 13th highest xwOBA respectively. The contact quality surrendered by Biagini with runners past first was dramatically higher. To offer some perspective, that same difference (0.1447) is larger than the gap between Mike Trout’s wOBA (1st @ 0.437) and Kevin Pillar’s (130th @ 0.302). With runners in scoring position in 2016, Biagini actually pitched to better contact quality than with the bases empty. He was coming out of the bullpen more in 2016 than last year, but it still leaves our question of consistency unresolved. Craig Edwards had similar results in an earlier piece on statcasts’s xwOBA consistency. It doesn’t seem like Biagini’s pitch selection was much at fault either. Based on the table below, his distribution of pitches with and without RISP last year was different, but still very similar. What we can see though is that the roughly 8% drop in his fastball usage is something to consider. If you care to see the batted ball xwOBA splits against each of his pitch types with and without RISP, below is a chart instead of a table. I chose to do this because it gives a better idea of the magnitude of the difference here. 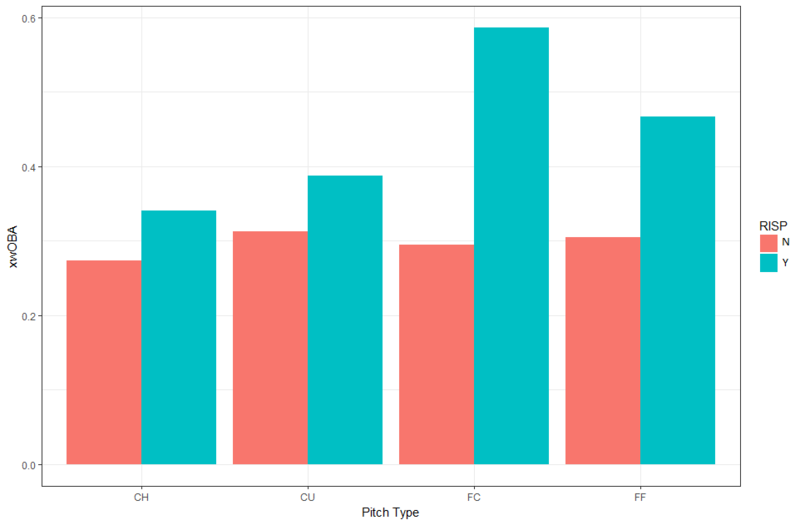 While every pitch performed slightly worse with runners in scoring position, the fastballs clearly suffered the greatest setback. I do wonder if this was the reason Biagini stayed away from the fastballs a little more when runners were in scoring position. All of this said, I don’t know the real explanation for these 2017 struggles. Much like the conclusion in Craig Edwards piece, the quality of batted balls surrendered by a pitcher lies much more in the hands of the hitter. 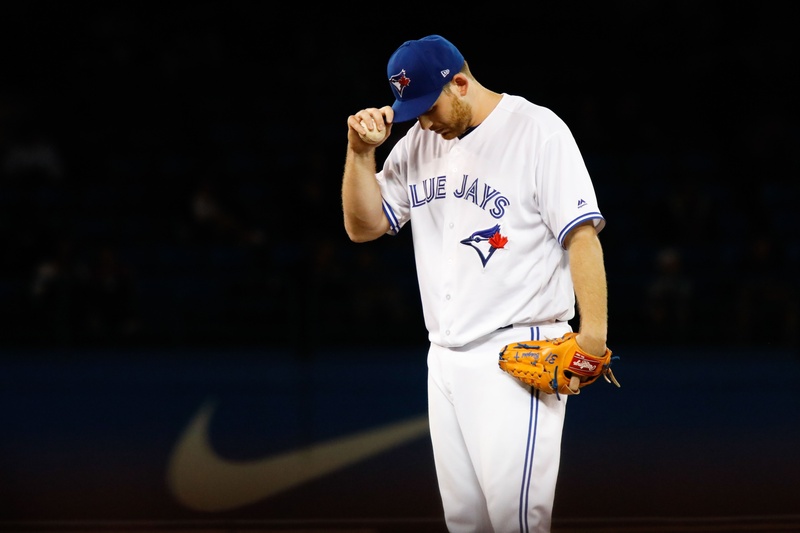 Perhaps Blue Jays fans have a reason to be more optimistic about Biagini’s outlook for 2018. We’ve seen that in 2016 he didn’t seem to have the same problem with RISP that undeniably inflated his 2017 stats. There’s no denying that when his stuff is working, Joe Biagini’s ability to control contact quality is quite impressive. Assuming this was just bad luck, I’d be willing to take the under on his RISP spread coming into this coming year, which would suggest that there’s more upside in his numbers.